The burgers (sourced from Turner & George with a very coarse grind) were chicken battered on one side and then and blitzed on the super hot induction hob to form a crusty batter. 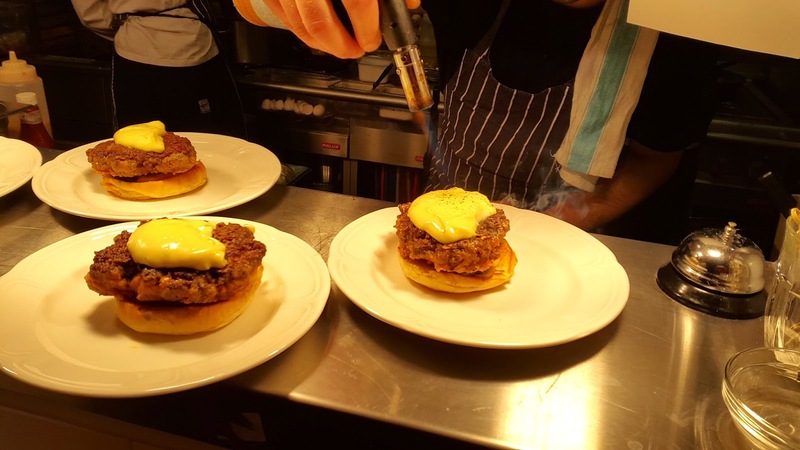 The burgers were then allowed to cool down, and when ready to serve were seasoned and seared on the other side on the same induction hob - keeping them beautifully medium rare in the middle and produce a caramelised crust to be envious of. Inside the burger you had a layer of French's mustard and Pitt Cue Co. house pickles, along with a bechamel style cheese sauce infused with bone marrow, and braised onions. 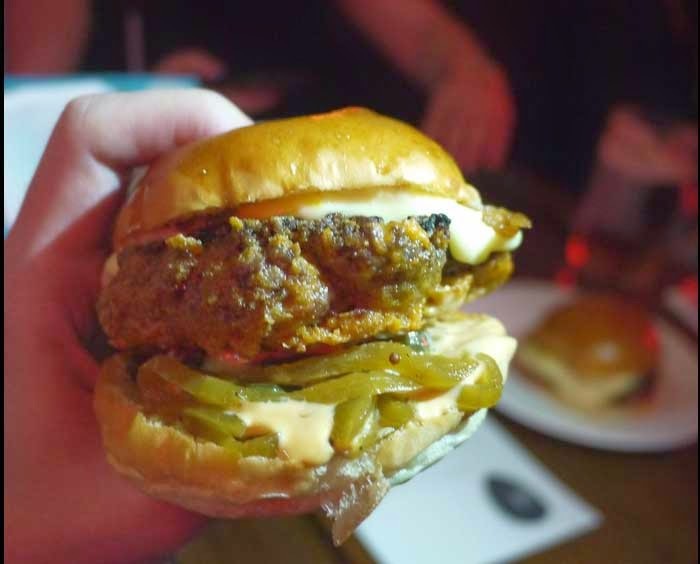 The bun is an unseeded version of Bleecker St. Burger's sesame seeded bun - toasted - and it's spot on for this burger. 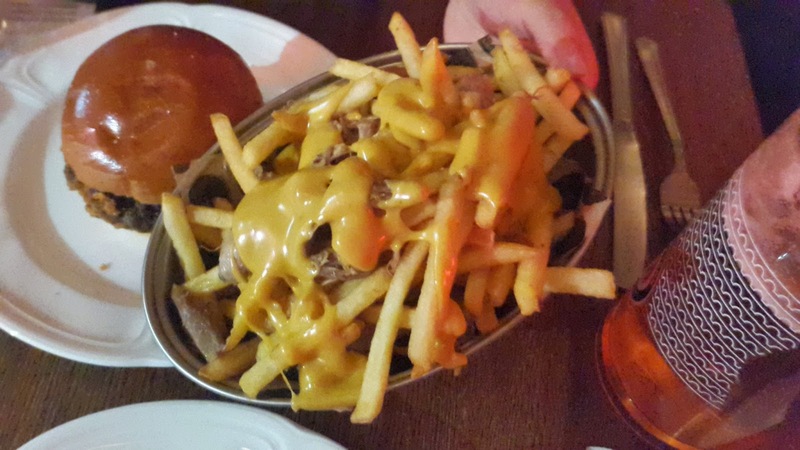 The burger was accessorised with the frankly awesome foie gras cheese and confit duck fries. Yes, you heard me. FOIE GRAS and CONFIT DUCK! These are pretty much as awesome as you'd expect, ingredients-wise. Raclette cheese was melted with foie gras (in a ration of 2:1!) and then poured over crispy salted french fries and pulled confit duck. Brilliant. I'm focusing on the burgers here, but that's in no way to take away from the fantastic korean spicy beef starter, and the peanut butter and jelly cheesecake - which were also very, very good. Salad for the rest of the week, methinks...yeah right - how about the Shake Shack St. Georges Day special burger, instead. Now that I've cleaned the drool off my keyboard... Can you give some more details about the cooking process? I understand, from the internet, that "chicken fried" means deep fried, but am not sure what "chicken battered" means. Or is it the same thing? So was one side simply deep friend and the other done on the induction hob? Was there some kind of coating put on the burger before it was deep fried? Oh gawd, I'm drooling again...! 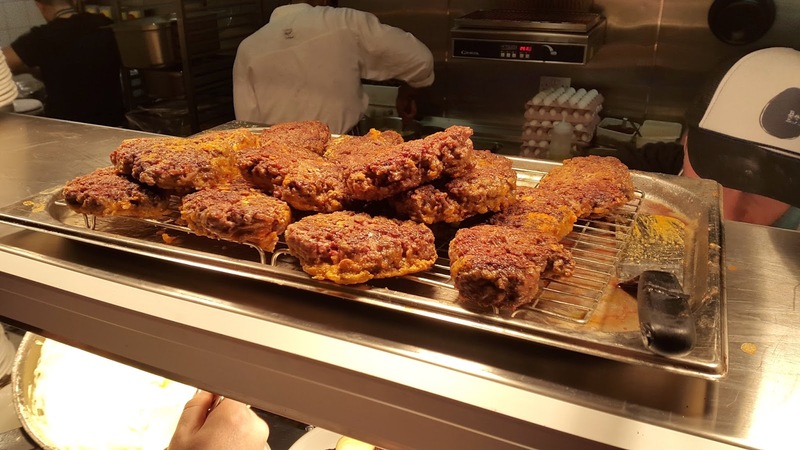 Chicken-fried steak is just thin, tenderised steak that is dredged in a Southern-fried chicken style application of buttermilk and seasoned flour before being fried. So I assume this is much the same. Thanks for that. Looking at the photo it makes perfect sense.